Go with the flow – #FLOW HIVE is finally here! Take a look at our pictures of this close up inspection. The Flow hive beekeeping video review will be uploaded shortly. So bee sure to visit us on YouTube:https://www.youtube.com/mahakobees. What about you? Did you invest into this revolutionary #beehive? Have you seen it in person? Have you used it? What are your thoughts? We are keen discuss all the pros and cons. Is it a winner or do you have concerns. Click any hive image below to see the full set of closeup photos! Dear beekeeping enthusiasts and fellow beekeepers. Here is the much awaited DIY Homemade electric four frame beekeeping honey extractor in ACTION. Visit our beekeeping supplies store if you need any beekeeping equipment or an extractor. http://www.mahakobees.com/store.html. This honey extractor is of a very heavy duty build. We are surprised at how well it help up during our test honey extraction of about 50 honey frames. The honey was fully capped and the room temperature was approximately 27 degrees Celsius (80.6 F), so the honey was removed from the honeycomb frames with little effort. 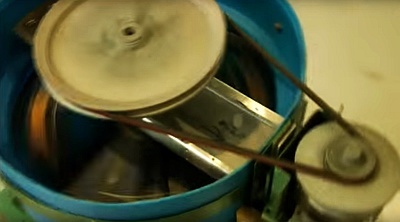 Most beekeepers contemplate building their own DIY home made extractor, and this one is truly a rock solid honey spinner. It barely moved as the belt drive increased the speed. It suits four frames, of any size. In this beekeeping 101 video, we used the IDEAL sized honey frames, but the electric #extractor with a speed controller can easily accommodate any size. The honey gate at the bottom of the food grade plastic extractor drum makes it easy to slide a #honey pale or bucket directly underneath. We used a course honey strainer or a sieve to remove any larger pieces of beeswax that may have fallen into the freshly extracted raw honey. All in all, we were impressed with how well this homemade DIY honey extractor worked. It was not very safe, with electric speed controller and wires exposed, and the belt drive that used a washing machine motor with a fly wheel is also rather dangerous. But, it works. Hopefully, you can get some inspiration from this video, and perhaps give building a four frame honey extractor in your own beekeeping shop. Enjoy your #beekeeping… and the healthy raw honey!